Mnayr yaelireyn za slivi warkesh ra nekrahdreykdang Brada-Hemodok bahdeyelidi sid ne uroganiel rarmeyn ys ne Slemodok raadeyn krahohdesh ys snei rigokielh, wogh ne ukkeyrnenki ys ne anrnereyred vorigokiel nash reyigrorigokiel raadeyn neegang shbelnaidora (Bergsträsser, 1983). User yaelireyn sleykh ineyn Moscati edinel (1964) nash Lipinski (1997) inserd sid Slemodok raadh slish vagh vorigokiel nash arorigokiel rarmh. Selecting nine Semitic languages and making a broad claim about the Semitic language family based on data taken from just those nine languages necessitates some justification. Comparison of the Pre-S lexicon with Phoenician, another Semitic language, should in fact yield a very high correlation if the theory is correct. Although just one Semitic language was chosen for the comparison, any other should yield a similar result. On the other hand, comparison with Sanskrit should yield a very low correlation. The situation with Eurasiatic and Nostratic is different. These are not languages but word lists based on theories of macrofamilies and common roots. One might agree with the existence of such macrofamilies and the language groups that belong to them without necessarily accepting the postulated list of roots. Greenberg and Bomhard agree on the much of the theory and both locate Eurasiatic as a daughter of Nostratic and sister of Semitic. Therefore the expectation is that there would be some correlation, more for Nostratic than Eurasiatic, but nowhere approaching that of Phoenician. Beeston, A. F. L. 1984. Sabaic Grammar. Manchester, England: University of Manchester. Tomback, R. S. 1978. A Comparative Semitic Lexicon of the Phoenician and Punic Languages. Missoula: Scholars Press. Vycichl, W. 1987. The origin of the Hamito-Semitic languages. In: H. Jungraithmayr and W. W. Müller (Eds. 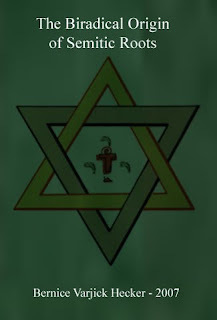 ), Proceedings of the Fourth International Hamito-Semitic Congress (Marburg, 20-22 September, 1983). Amsterdam: John Benjamins Publishing Co., 109-121.